The Decatur model home on lot 16 at San Juan Passage includes a two-car garage, and all irrigation and landscaping is included. ANACORTES — The recently completed Decatur model at San Juan Passage is designed for homebuyers who dream of living the coastal experience. Located in the community’s Water’s Edge neighborhood, the home’s namesake is a 3.5-square-mile island that forms the eastern edge of San Juan County. 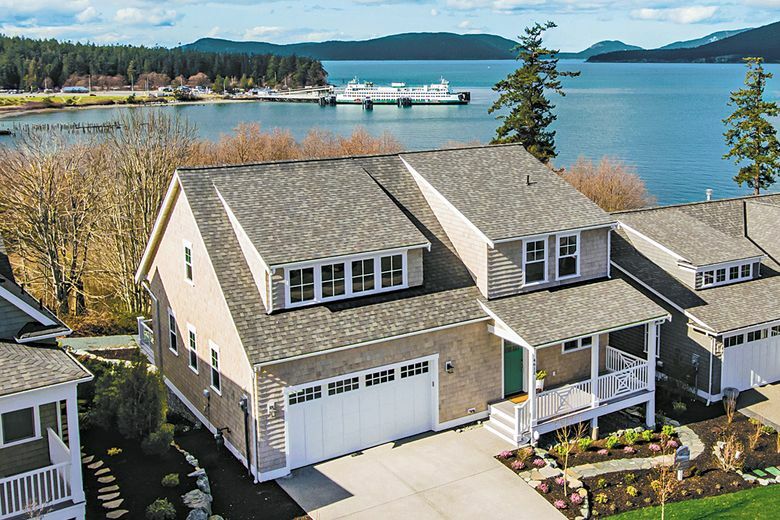 The picturesque oasis, 5 nautical miles from the western shore of Anacortes and reachable only by private vessel, is home to just a few residents. By contrast, San Juan Passage is 2 miles away from downtown Anacortes and its numerous shops, restaurants, marinas, medical facilities and other services. “What our residents love about San Juan Passage is that they can enjoy the beauty and harmony of island living without giving up the conveniences they cherish,” says Sandi Davidson, the community’s sales director. There is a custom coffered ceiling, a fireplace and built-in cabinetry in the living room. French doors lead to a covered view deck. She says homeowners’ amenities don’t end with the town, however. At San Juan Passage, Gilbane Development has created an award-winning hillside neighborhood that includes view-swept parks and walking trails. This includes the landscaped Overlook Park, where a natural stone amphitheater features views of the Anacortes ferry landing, Guemes and Bellingham channels, and the San Juan Islands. Access to the beach is an easy walk via the community’s Overlook Trail. It also connects to the Guemes Channel Trail, which follows the shoreline toward downtown Anacortes. Located on lot 16, the 3,075-square-foot Decatur model home features Nantucket-style architecture, including a front porch, accent widows, a sea-green entry door and natural hand-dipped cedar shakes. The rear of the home faces a tree-sheltered path. 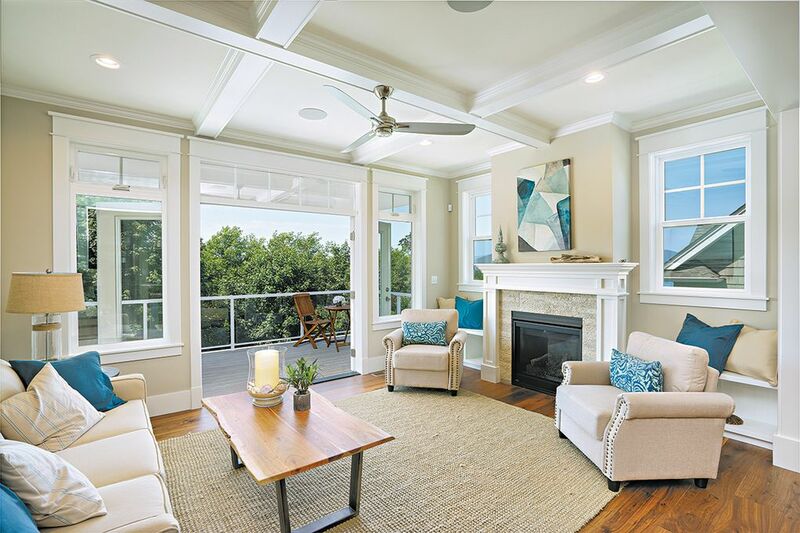 The Decatur model home at San Juan Passage features a covered view deck that overlooks the ferry landing. Inside, hardwood floors in beach tones extend from the entry and guest bath into the great room. A chef’s kitchen is appointed with quartz slab counters, stainless Thermador Professional appliances, a farm sink and ceiling-height cabinets. There is a custom coffered ceiling, a fireplace and built-in cabinetry in the living room. 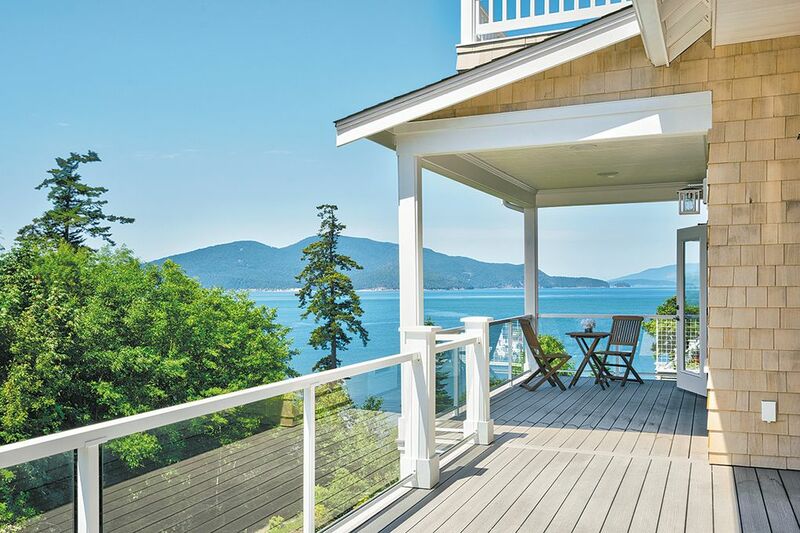 French doors lead to a covered view deck that overlooks the ferry landing — an ideal spot for relaxing or entertaining. One of the home’s two master suites adjoins the great room and includes a private entry to the deck. The suite features an oversize shower and a towel warmer. A second, larger master bedroom upstairs has a view balcony, a walk-in closet and an oversize master bath with soaking tub. The upper level also has a bonus room wrapped in shiplap walls, as well as a guest bedroom with built-ins and water views. The lower level includes a wet-bar area, media room, storage areas and a guest bath. The arrangement can be ideal for visitors or family members who favor a separate, private space. There is access to a rear porch and backyard overlooking the channel. Overhead speakers are positioned throughout the home. The Decatur includes a two-car garage with additional storage space, and all irrigation and landscaping is included.